2019 APA Legislative Day. Photo by Sam Le. It’s the start of a new year. Many of us have turned our faces to the year ahead, searching for ways to bring balance, health, and prosperity to ourselves, our families, and our communities. But individual action can only go so far. Our health and well-being are deeply influenced by underlying socioeconomic factors, like having a steady income, safe and affordable housing, and educational achievement. For too many of us, these things are increasingly out of reach thanks in part to Washington’s upside-down tax code. It’s no longer a secret that Washington’s tax code is rotten – we’re ranked last in the country with the most regressive, upside-down tax code of all 50 states. Despite our booming economy, our tax code actually prevents Washington from raising enough revenue to invest in every community equitably. Low- and middle-income workers are asked to pay a share of their income six times larger than the wealthiest in taxes. That means those at the top reap the benefits while hardworking families struggle to afford the basics. The impact of our tax code is especially real for communities of color. It doubles down on decades of racist policies and practices by making sure the wealthiest, whitest households in our state get the best deal. Without adequate revenue, we can’t invest in the affordable housing, healthcare, and education that leads to better well-being for our futures. This is our reality. Lawmakers could change that reality for nearly one million people this year by passing an innovative policy solution: the Working Families Tax Credit. The Working Families Tax Credit is Washington’s version of the federal Earned Income Tax Credit (EITC), proven to be one of the most successful programs to lift families out of poverty. 29 states (plus D.C.) already have their own state-based versions of the program – Washington should be next. The credit would put cash back into the pockets of low- and middle-income families via a sales tax refund, with the average credit ringing in at around $350. That money can make a real difference, and it’s flexible so families can spend it on what makes the most sense for their needs, like paying for safe and secure housing, a doctor’s visit, or the costs associated with school. • Researchers estimate that passing the credit could lead to 228 fewer low birthweight babies in our state. This matters because healthy birthweight babies are healthier overall, and in the long run do better in school and have higher lifetime earnings than their low birthweight counterparts. • Research into the federal EITC also shows that a $1,000 increase in family income from the credit has been associated with higher math and reading scores, increased high school graduation rates, and college success for children of beneficiaries. • Because education is so critical to long-term success in life, children in families who receive the EITC also earn more and have better employment outcomes long term. • The Working Families Tax Credit can also alleviate the housing cost burden for working families across the state with meaningful returns in income. And given that this policy would have an outsized positive impact on communities of color because of the legacy of racist economic policies we mentioned earlier, this credit would be especially beneficial to so many families in our community who are having a hard time making ends meet. If passed, the credit would also make improvements on the federal version – expanding eligible recipients to include workers without children, low-income students, working immigrants without citizenship, and people who stay home caring for children, elderly relatives, or family members with disabilities. 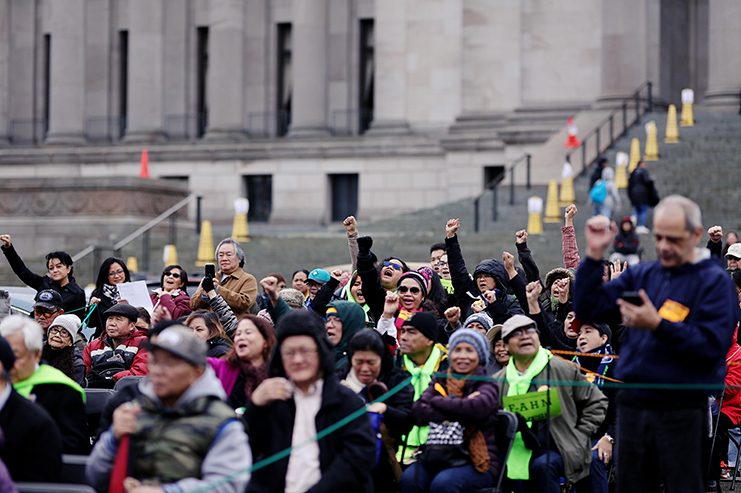 That means the credit could actually meet the needs of Washington’s many Asian American workers and families who have multiple generations or relatives outside their immediate families living with them, or who are in school studying to kickstart future careers, or who are contributing to our communities as workers without citizenship. We deserve to live in a state that recognizes our hard work and supports all of our well-being, not just those with the most privilege and power. Our city and region is changing faster than ever as wealthier, whiter Washingtonians move ahead, and low- and middle-income families of color are held back and pushed out, destabilizing the health and safety of our communities. For that to change, we need to invest back into the people most impacted by our upside-down tax code. Our lawmakers need to be strategic and targeted in how they use the revenue we have. Call or email your legislator today and tell them to support the Working Families Tax Credit so all of us can achieve the balance, health, and prosperity we deserve. Margaret Babayan is the Betty Jane Narver policy fellow at the Washington State Budget & Policy Center and Jennifer Tran is a senior policy analyst at the Washington State Budget & Policy Center – an organization that works to advance shared prosperity and racial equity in Washington state.